Forward Global Women fosters and nurtures the development and growth of women leaders to become active peacemakers promoting co-existence. We envision a world where women are actively engaged in conflict-resolution and peacemaking. The 2014 convening participants in Berlin, Germany. Forward Global Women is a 501(c)3 nonprofit that convenes and trains women leaders in political and civic life from the MENA countries of Jordan, Palestine, Israel, Tunisia, Egypt, Morocco along with USA women. 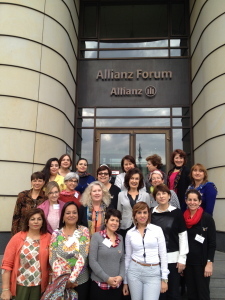 Convenings have been held in St. Paul, MN; Berlin, Germany; Nicosia Cyprus; and Oslo, Norway. United Nations Resolution 1325 supports women’s participation in peacemaking negotiations at every level. An important follow up to that resolution are National Action Plans on Women, Peace and Security. More than 30 countries across the globe are developing National Action Plans to promote the essential role of women in securing peace. Unfortunately, many MENA countries are not among them. The United States effort was finally launched by Executive Order but still needs support from the US Congress. Data on each country is available at www.peacewomen.org. DONATE to our cause. Every bit goes towards fostering peace among MENA nations.